Openfiler converts an industry standard x86_64 architecture system into a full-fledged NAS/SAN appliance or IP storage gateway and provides storage administrators with a powerful tool to cope with burgeoning storage needs. Openfiler ensures that storage administrators are able to make the best use of system performance and storage capacity resources when allocating and managing storage in a multi-platform network. Openfiler provides key features such as iSCSI target for virtualization, Fibre Channel target support, block level replication and High Availabilty that are the mainstay of any business critical storage environment. Openfiler is the first commercially viable Open Source NAS/SAN solution and it comes with a wealth of features and capabilities that address specific storage management pain points. First, it can be installed on industry standard server hardware, negating the need for expensive proprietary storage systems. Simply run through the 10 minute installation process on an industry standard server from Dell, HP, IBM or Compaq, setup configuration in 10 minutes and you are left with a powerful networked storage appliance. Also, unlike many proprietary storage solutions, Openfiler management is performed via a powerful and intuitive web-based graphical user interface. 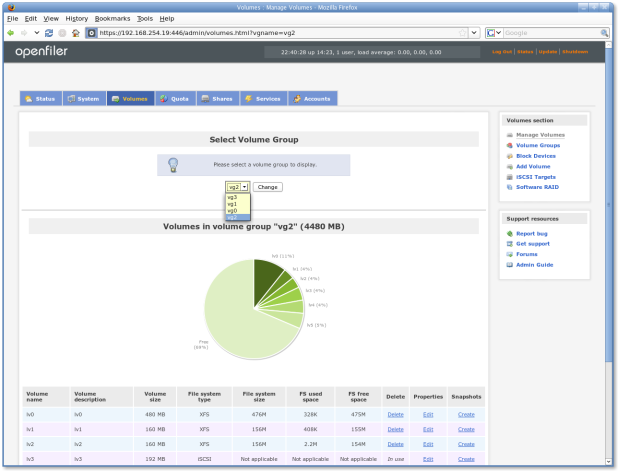 Through this interface, an administrator can perform various administrative tasks such as creating volumes, network shares, allocating disk quota for users and groups and managing RAID arrays. As a purely software-based solution, Openfiler can be downloaded and installed in minutes on any industry standard hardware. It is the perfect solution for redeploying or breathing new life into previously ancillary hardware resources. It can be used to build a storage gateway for existing deployed SAN or DAS storage systems. In that context, Openfiler creates new avenues for sharing existing storage capacity. Openfiler supports a plethora of hardware RAID and Fibre Channel controllers and disk technologies such as SAS, SATA and SCSI. Fast, Gigabit and 10 Gigabit Ethernet controllers from Intel and Broadcom can also be integrated to provide high bandwidth access to data over a TCP/IP network. And, of course, both the Intel Xeon® and AMD Opteron® range of x86-64 architeciture enterprise computing processors are supported. RAID controllers from vendors such as Adaptec, LSI Logic, HP, IBM and Intel are fully compatible, amongst others. For Fibre Channel, Openfiler support PCI-E and PCI-X host bus adapters from Qlogic (initiator & target) and Emulex (initiator only). Openfiler supports a number of network interface controllers including Intel and Broadcom based chipsets. For very high bandwidth requirements, 10Gb Ethernet and Infiniband interconnects are excellent options. Openfiler presents a unified storage export paradigm by supporting both block-level and file-level storage networking protocols. Storage may be allocated across any or all protocols simultaneously allowing data to be accessed from a heterogeneous base of network clients - be they Unix, Windows or Mac. 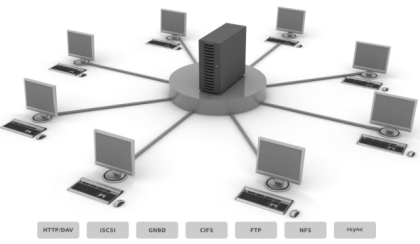 As the transition in horizontal scale-out of computing resources by taking advantage of Operating System virtualization technologies gathers pace, iSCSI target functionality in Openfiler stakes a claim in the sphere of compelling solutions to the problem of allocating and managing backend storage to complete the overall virtualization architecture. In Openfiler, iSCSI coupled with Openfiler's powerful dynamic volume manager gives administrators a powerful and flexible storage networking solution that will scale in terms of performance, reliability and availability. No amount of technical features in a storage solution can compensate for a lack of good administrative capabilities. Openfiler meets this challenge head-on with its powerful and intuitive web-based graphical user interface (GUI). All facets of the trove of storage networking capabilities in Openfiler are controlled via this management interface. Management capabilities are grouped into separate sub-interfaces in accordance with their functional domain; networking, physical volumes, user and group authentication/authorization, system configuration and status information are each given a scope. At the base level, allocation of disks or other block-level resources such as hardware RAID volumes into distinct components can be achieved within the physical volume management scope. Physical volume management is in turn a sub-domain of the overall volume management capabilities in the GUI which includes features such as dynamic volume aggregation, logical volume allocation and distribution and point in time copy (snapshot) management. Administrators will also appreciate the ability to perform resource limiting tasks with the excellent quota management tool. Openfiler supports quota management for both users and groups. The storage resource allocation rules allow the administrator to control the amount of disk capacity usage as well as as the number for filesystem objects, files and directories, that a user or group may take up. If a group is allocated a certain amount of resources, the administrator can further limit resources for particular users within that group. This level of granularity in resource management cannot be emphasized enough. Openfiler also presents the administrator with a view of system status - displaying system resource usage such as memory, processor and storage capacity. This allows the administrator to better plan for future resource allocation requirements.